Peerless Pressure Washing and Roof Cleaning Inc. of Tampa Bay Florida offering safe, non-pressure chemical roof cleaning. The black and moldy stains on your roof, Gloeocapsa Magma, is a type of algae that thrives in Tampa’s humid and warm climates. It usually appears first on the North slope of the roof where shade is prevalent and moisture tends to accumulate. The result is a discolored (black/green) streaked roof. This problem is not only stealing curb appeal and value from your home, it is also infecting other surfaces of your property along with surrounding properties. This fungus, along with other molds, are feeding on the organic matter used in the manufacturing of your shingle. If allowed, the fungus will continue to spread causing premature granule loss of your shingle. These ceramic granules reflect the heat from the sun and help keep your home cool. Once this protective barrier is lost, the heat is allowed to penetrate the shingle causing premature aging and increasing the energy costs of your home. Tile roofs can also be infected with the same fungus and mold. Even worse, the mortar on your tile roof can be weakened by the fungus. The end result is a cracked and discolored mortar. The mold will also strip the color and glaze from the tile leaving a dull, unpolished surface. If allowed, mortar replacement and color restoration can be extremely costly to the homeowner. Even more harmful to your roof is allowing high pressure cleaning with surface cleaners made for concrete year after year. Peerless Pressure Washing and Roof Cleaning of Tampa Bay, services both kill and retard these fungi while protecting the quality of your roof. Our non pressure chemical roof cleaning system can last as long as 5 years! 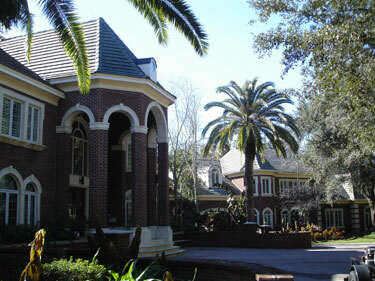 Peerless Pressure Washing and Roof Cleaning, located in Valrico FL. offers a mold, mildew and biostat preventative with its cleaning product known as “Peerless Punch.” Our cleaning agents are applied at the same pressure as your home shower but at a greater volume (gpm). This application is the safest for all roof surfaces and requires minimal walking on the roof. The Asphalt Roofing Manufacturers of America states in its tech bulletin, “Caution! High pressure washing systems for algae removal should not be used.” As a Brandon area homeowner, it is imperative you heed this caution in order to protect the integrity of your investment. “Peerless Punch” is a soap developed by me, Tom Peerless. Through countless hot sunny Tampa Florida days spent on roofs I have learned and developed what is the absolute best cleaner to disinfect and stop the mold in its tracks. In order to kill the plant growing on your roof without killing the plants below, we use the weakest effective ARMA approved solution. This is obtained cleaning with large amounts of weaker solutions instead of small strong straight chlorine solutions with small gallon per minute pumps. “That’s just strong bleach” is a common mistake most folks assume. Have you ever heard horror stories of homeowners’ plants and grass dying after a roof cleaning? That is what will happen if just strong bleach is used. Not only is this dangerous to your plants it is the wrong way to clean your roof according to ARMA (Asphalt Roofing Manufacturers of America), which regulates asphalt shingle roof specifications. Not only do we follow these guidelines we take it a few steps further, adding emulsifiers and gelling agents into our solution. A simple question to ask a “so-called” “Tampa area non pressure roof cleaner” to be sure they are using an ARMA approved solution would be: What gallon per minute and psi pumps do you use to deliver the ARMA approved solution? A pressure washer alone can not deliver the suggested strength of soap to “kill” the fungus. Therefore, these pressure washers must then use “low pressure” to remove the loosened fungus off of your roof, removing the heat absorbing granules with it. Peerless Pressure Washing and Roof Cleaning utilize custom, made to our specifications, roof cleaning pumps that do not even resemble a pressure washer. These pumps are made to deliver the large gallon per minute flow needed of Peerless Punch with minimal pressure to your roof.